After what seems like forever, we are finally just a day away from Notre Dame football to take the field once again. Thankfully, this will be the last post in which I do nothing but do complete projection and guesses about a game or the season. After tomorrow, I will be in the much more comfortable area of results, stats, and analysis. Especially more so because I hate opening games like this one. USF is far from a pushover, and, although the Irish had a strong end to 2010, there are no guarantees for 2011. Brain Kelly is only entering his second season and, based on his most recent presser, has just now become completely comfortable and has a feel for what the Irish are capable of on both sides of the ball. This seems to make sense based on the end of last year with the emergence of both a running game and a solid defense. Add on to that, you have Crist trying to come back after being involved in none of the fun and a Holtz walking into ND stadium ready to walk out as just more than “Lou’s son”. B.J. Daniels is quite the curious case. He’s a sub 2,000 yard/year passer. His stats from 2009 are far more impressive than his 2010 campaign that included a bowl win against Clemson that he took MVP honors in. Despite that, his passing completion percentage actually got better and relied far less on his legs in 2010 (although his TD/INT ratio went the wrong direction going from 14/9 to 11/13). He can be the reason USF can win or lose any game. And if he happens to figure it all out this Saturday, ND could be in deep trouble. 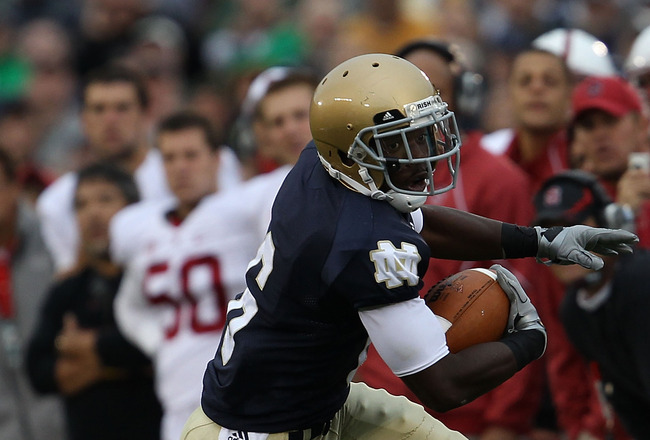 Think Denard Robinson in 2010 against ND. After that game, it looked like Robinson was on his way to a Heisman Trophy. As time would later tell though, he played out of his mind against a ND defense that was still trying to find its identity. Granted, ND’s defense is a whole hell of a lot better this time around; however, we have not yet faced an atheltic QB like Daniels since they put it all together (and Jacroy Harris doesn’t count). Daniels is also heading into his third year of significant playing time as USF’s QB. It shouldn’t take ND fans much to remember that some of our own QBs found serious traction in their third year after initial troubles and underwhelming performances (Quinn and Clausen). Daniels will also have weapons in WR A.J. Love and RB Darrell Scott whom could also burst on the scene tomorrow. Love missed the 2010 season with an ACL tear in USF’s spring game, allowing him to achieve the rare 6th year senior status. In 2009, he was USF’s second best receiver with 489 yards, and, while that’s hardly going to strike fear into an Irish fan, he ended his 2009 campaign with 2 TDs in USF’s 2009 bowl game which catapulted him to to a tie for the team lead. He’s no Michael Floyd, but he’s no slouch either. Scott on the other hand is a transfer RB from Colorado who sat out the required year during 2010. While his numbers from Colorado are rather non-existent, he did manage to rack up 564 kick return yards, showing that the athletic ability is definitely there. He’s going to be looking to make a name for himself at USF and he has Brain Kelly’s attention, seeing as Kelly actually mentioned him by name in his presser. He will be facing one of the stoutest front sevens that the Irish have fielded in years though. This wildcard worry could definitely become a non-issue in a hurry. While I think USF’s chances to upset the Irish rely on Daniels and the Bulls offense, it would be a crime to omit the USF defense from this discussion. In 2010, USF was ranked 17th in total defense giving up only 317.92 yards/game. Sure, feel free to point at an easy Big East schedule if you’d like, but this is a team that faced off against Florida and Miami out of conference last season. Simply put, you can’t discount what they did on defense. USF lost five defensive starters, but they return six, including three from the secondary. This includes senior safety Jerrell Young would led USF in picks with three. However, some of the biggest losses come from their defensive line that only returns one starter, redshirt junior DT Cory Grissom. The question here will be if the losses on the line will prove to be too much for USF to overcome or if the experienced secondary will be able to help hold everything together. Ok, sure, Dayne Crist needs to have a solid game. Michael Floyd is the playmaker to watch. Manti Te’o and Harrison Smith are expected to lead the Irish defense as well. But let’s be honest, USF has spent an entire offseason knowing this and working a game plan around the big Irish stars. We need to dig a bit deeper for the players that need to step up for the Irish to have success. For this game, I honestly believe that the Irish defense will be a strength against USF, so I’m looking for big performance from two players on the offense: Theo Riddick and Cierre Wood. Riddick has been projected by many (including a few members of the IBG) to have a breakout year this season. I for one am hoping tomorrow is a big start in that direction. For the Irish to have a truly fearsome offensive attack, they will need to have more weapons spread out wide than just Floyd. I’m not talking about just having a solid game here or there either. The Irish need someone that the defense has to truly worry about and scheme around. Otherwise, opposing defenses will leave double coverage on Floyd all day long, begging for the other receivers to make them pay. Considering that USF does return an experienced secondary, Riddick needs to make a splash early and force the Bulls secondary to focus on the whole field. This will allow Floyd to get the space he needs and give the Irish a formidable 1-2 punch that the Bulls must respect on every passing play. As I mentioned in my offering to the IBG, I’m looking for Cierre Wood to also have a breakout year. Our success at the end of last year can be greatly attributed to our running game finally seeing some success. With Armando Allen and Robert Hughes now gone, the load now falls squarely on the shoulders of Cierre Wood and Jonas Gray. Wood, however, needs to be the stud, the playmaker, the one that makes you hold your breath in anticipation every time he touches the ball (and not because you are worried about a fumble either…). With Crist back under center (or back in the shotgun), the Irish should be reverting back to several more QB read option plays. By now, Crist should have a much better feel for when to keep and when to hand the ball off, leading to some nice holes that Wood needs to attack and take major advantage of. Of course, beyond that, the focus right now for defenses in general will be the passing game of the Irish. Much like Riddick, Wood needs to force defenses to respect the running game to open up the field. This is an even more important task against USF as the Irish need to attack the inexperienced defensive line of USF. If the running game falters and the Bulls line gains some major confidence from holding the Irish at bay, expect some major offensive issues the rest of the way. Expect this game to initially scare the ever living hell of out every Irish fan. It may last a quarter, it may last a half, but USF will come out on fire and the Irish offense will take a little time to hit their stride. The Irish defense will ensure that the game won’t get out of hand and should force B.J. Daniels into a mistake or two before all is said and done (crazy prediction here: the first Irish TD is scored by the defense). Once the Irish knock of the offseason rust, the offense will click and happy days will be here again. Initial worries will turn to joy as the Irish will eventually put this game out of reach and win quite comfortably. I like your “First Irish TD scored by the Defense” It would be a hell of a way to start off the season.